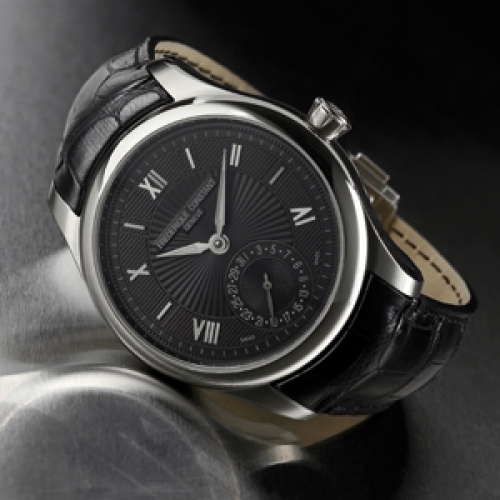 The Maxime Manufacture Automatic Silicium (Silicon) brings yet more proof of Frédérique Constant's expertise. Manufactured as a limited edition of 888, this timepiece beats to the rhythm of the FC-700 calibre, designed and made in the Genevan watchmaker's workshops. Beyond its peerless technical qualities, the Silicium escapement underscores the brand's technical maturity and excellence. The refined charcoal grey of the dial draws beautifully on the subtle aesthetic of straight lines and curves. The centre of the dial is enhanced with a sunburst guilloché decoration. The date is displayed in a counter at 6 o'clock. The straight line of the Roman numerals is accentuated by the hand-polished hour and minute hands and the convex sapphire crystal. 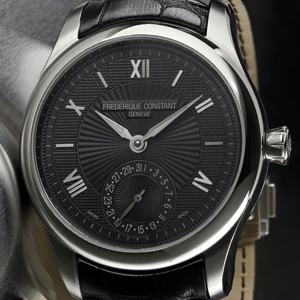 Once again, Frédérique Constant demonstrates its philosophy of innovative timepieces at affordable prices.